Erno Goldfinger. Image from BD online. Now synonymous with London’s post war urban architecture, Erno Goldfinger arrived in Britain in 1934. He was born in Budapest in 1902, moving to Paris to study architecture in 1921 and then practice, before moving over the channel with Ursula Blackwell who he had met in France. They married and settled in London, building a family home in Willow Road, Hampstead. The construction of his home gave Goldfinger his first taste of fame and notoriety, something he would not shy away from throughout his career. Goldfinger created a number of smaller, often domestic and commercial, projects in the 1930’s; a house in Broxted, Essex and shops such as 2 Golders Green Road and Abbatts Toy Shop, Wimpole St (1936). The post war period would see Goldfingers biggest projects, although he was only given the brief to design a retail kiosk for the 1951 Festival of Britain, despite creating a number of other designs for the festival. His first big project was the Elephant & Castle redevelopment, creating homes, shops, offices and leisure facilities from 1959-66. 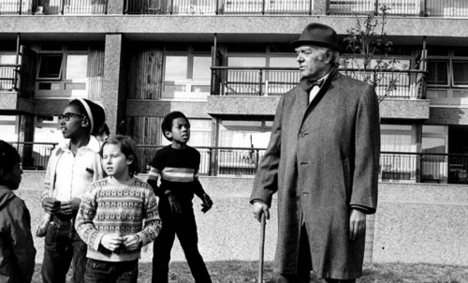 In the mid 1960’s the two projects that would come to define Goldfinger began, the three block at Rowlett St, Poplar (Balfron Tower, Glenkerry House and Carradale House) and the Cheltenham Estate, (featuring Trellick Tower) in Kensington. These buildings, like Goldfingers reputation, went through their low points before being rejuvenated towards the end of the 20th century. Goldfinger, apart from a couple of months spent in Trellick Tower, lived the rest of his life at 2 Willow Road, dying in 1987. His house is now part of the National Trust and open to the public. Featured Buildings: 2 Golders Green Road, 10 Regents Park Rd, Alexander Fleming House, Brownfield Estate, Haggerston School, Hille House, Trellick Tower, Westville Road School, Willow Road.